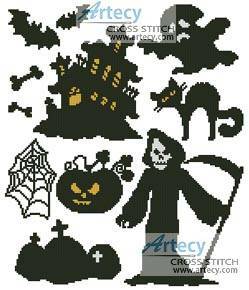 Halloween Motifs 2 cross stitch pattern... This counted cross stitch pattern of different Halloween silhouette motif designs was created from an image courtesy of www.photostogo.com. Average size for each design is 50 stitches x 50 stitches. Only full cross stitches are used in this pattern.